The global anesthesia gas blender market report comprises a detailed elaborate executive summary, which includes market snapshot that provides information about various segments. It also provides information and data analysis of the country’s market with respect to the segments based on technology, system type and end user. An elaborated qualitative analysis of drivers and restraints, opportunities, and trends has been provided in the market overview section. This section also provides market attractiveness analysis in terms of country, thus presenting a thorough analysis of the overall competitive scenario in the global anesthesia gas blender market. Based on technology, the market has been segmented into tube flow meter and dual tube flow meter. The market segments have been analyzed based on efficiency, cost-effectiveness, and increase in preferences for gas blending during prolonged anesthesia delivery. The market size (Value and Volume) and forecast for each of these segments have been provided for the period from 2015 to 2025, along with their respective CAGR for the forecast period from 2017 to 2025, considering 2016 as the base year. Based on system type, the market has been segmented into electronic and manual. The market segments have been extensively analyzed based on the rise in demand for surgical procedure and adoption of newly launched advanced products. The market size and forecast in terms of (value and volume) for each segment have been provided for the period from 2015 to 2025. The report also provides the compound annual growth rate (CAGR %) for each market segment for the forecast period from 2017 to 2025, considering 2016 as the base year. On the basis of end user, the market has been segmented into hospitals, ambulatory surgical centers and others. This segmentation has been done on the basis of usage of particular anesthesia gas blander in various healthcare organization for chronic condition and surgeries. 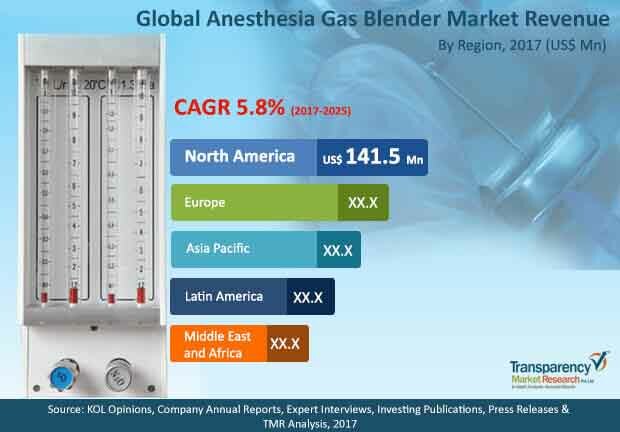 Geographically, the global anesthesia gas blender market has been segmented into North America, Europe, Asia Pacific, Latin America, and Middle East & Africa. The market size and forecast (value and volume) for each of these regions have been provided for the period from 2015 to 2025, along with their respective CAGRs for the forecast period from 2017 to 2025, considering 2016 as the base year.